Custom shower pans for local and national customers. No integrated drains, messy epoxy mastics, hollow curbs, or additional perimeter flashings are required. A PSI shower pan will clamp directly to a “floor-installed” common tile shower drain, has a solid-core curb, and it comes factory equipped with a perimeter “leak-protection” flange (No Additional Charge). PSI is the original innovator of the custom, leak-free ready to tile shower base. With just a few rough-in dimensions (View), we can precisely manufacture, and promptly ship, a pre-sloped, leak-free shower base that will perfectly fit your shower floor’s design. No need to pay someone to move the drain, or re-frame a wall to fit a premolded shower base size. With a PSI custom ShowerBase™, You can save money, time, and get exactly the size, shape and drain location you want. PSI products are similar to the nearly indestructible surfboards used by professional surfers. But Better! Starting with the highest density EPS core available, PSI is able to engineer a rock solid shower base. The shower base is factory sloped to the drain, and surfaced with two types of composite fibers embedded in an advanced epoxy resin (View) – thus ensuring strength and surface durability. The flange and curb are fusion welded to the perimeter. Finally, it is coated with an elastomeric primer that allows you to install your tile directly to the surface. Why choose the PSI ShowerBase? We want you to feel confident in your experience with us and answer any questions you might have. Here we have provided some of our most commonly asked questions in hopes that you’ll find the answers you need. As always, if you need further information, we invite you to contact one of our trained representatives who will gladly assist you. What is the shower base made out of? We start with a 3-pound high density EPS core and shape the base with a 1/4″ per foot (2%) slope to the drain. In its raw state, the 3-pound EPS is tough; However, both surfaces (top & bottom) are then coated with a proprietary blend of hard coat epoxies and embedded composite fibers that gives the shower base its ultimate durability and strength. Next, the perimeter flange and curb are fusion welded to the sloped core. It is then coated in our elastomeric waterproofing and crack isolation membrane. It is completely waterproof and ready-to-tile. The flange is a 1/8″ thick, 5″ high FRP composite material that is designed to rise between the stud wall and the showers backer wall. The flange provides a water barrier to prevent water from exiting he shower during normal use, or in case of a “back-up”. The flange is fusion welded to the perimeter of the shower base’s core. This exclusive feature increases the likelihood that any moisture that was to penetrate the shower wall would exit into the shower base area, and not to the outside of the shower pan. A flange is attached to the perimeter of the shower base’s sloped core where a “curb” or “ramp” is not located. See next FAQ. What is the Curb or Ramp? The “curb” or “ramp” is sometimes referred to as the threshold. The curb is the perimeter component of a shower pan that you “step over”(curb)or “roll up”(ramp)when entering a shower. Our standard size curb is 4 inches (high) X 4 inches (deep) X (variable length). Our standard size ramp has a 6” “run” (the part that you roll up when entering the shower). The length of a curb or ramp depends on the shower bases individual specifications. We can customize both the curb or the ramp upon request (additional charges may apply). The curb is also where the shower door or glass block wall is placed. We can make the curb as long as you prefer: half curb, whole curb, double curbs or radius curbs. Ramp options are more limited. How do you install the shower base? Using a 3/4″ U-notched trowel (supplied with all shower bases), trowel some modified thin-set into the area that the shower base is to be installed (Important: do not use a “premixed” thin-set. It will not cure properly). Liberally apply a bead of polyurethane sealant (found at most home centers) around the outside perimeter of the drain’s flange. Then set the shower base in place, and ensure that it is well embedded in the thin-set. The thin-set takes care of any floor imperfections and is the adhesive that holds the base in place. Bolt the locking ring on the 4 bolts, and you have actually bolted the base to the flange. You can now stand on the base immediately and start your wallboard installation. What used to take days has been reduced to less than an hour. What kind of thinset should I use? Any quality “polymer modified” thin-set will do just fine. Do not use a premixed thin-set (ie….water already added). A premixed thin-set that comes in a bucket with water already added will not cure properly. Remember: No premix! Always add your own water! Different terms for modified thin-set include: modified thin-set, modified thin set with a latex additive, fortified thin-set, polymer modified thin-set, polymer fortified blended thin-set. The thin-set must meet or exceed ANSI A118.4 and ANSI Al18.11 requirements when mixed with water. Custom Building Products- usually found at The Home Depot. Their elasto-membrane is called Red Gard. Laticrete- usually found at The Home Depot, Lowe’s and other tile suppliers. Their elasto-membrane is called Hydro Ban. Mapei- usually found at The Home Depot, Lowe’s, Daltile and other tile suppliers. Their elasto-membrane called is Aqua Defense. Each of these companies also sells a rapid set product. What kind of shower drain do I use? A standard (PVC or ABS) 3-piece tile shower drain that uses a “clamping ring”, will work fine. We sell these drains on our online store;However, this type drain is available at most home improvement stores. Make sure you choose a brand that will allow the “strainer barrel” (the threaded part that holds the strainer) to thread down “flush” with your finished tile. We recommend, but do not require, the Oatey brand tile shower drain (this is the brand that we sell). What size hole do I cut in the sub-floor for the tile drain? If you have purchased one of our tile shower drains, you will need to cut a 5″ hole in the sub-floor. The drain’s “body” will need to recess into the sub-floor with the drain body “flange” supported by the sub-floor. Instructions on how to properly install a tile shower drain are available with every shower base we sell. How far down do I cut my pipe for the tile shower drain? 2 1/4″ inches below the top surface of the sub-floor will work as per our instructions; However, we strongly recommend that you determine this measurement once you have the tile shower drain “in your hands”. Will the drain fit to a cast iron pipe? There are adapters available. We do not sell these adapters. We recommend that you consult with a local plumber, or plumbing wholesaler about this issue. Local codes can vary. Why do I need to use the furring strips? Two good reasons! “Furring strips” are long thin strips of wood (or other material) used to extend your shower’s tile backerboard beyond the KBRS shower base’s flange. This allows the bottom of the backerboard to “sit” inside of the shower base. The flange is allowed to “free float” between the backerboard and the wall studs. This method is a “leak-protection” feature exclusive to only KBRS shower bases (patent pending). By allowing the backerboard to sit inside of the shower base, you will be ensuring that any moisture that may penetrate the tile walls, will exit into the sloped area of the shower base, and exit down the drain (where it belongs). You may also find that your shower’s stud walls are “out-of-square”. You can also use the furring strips to correct this issue if desired (we recommend it). Is there any size base KBRS won’t make? The short answer is….we haven’t found one yet. We love a challenge. How long does it take to make a custom base? Our average lead time is 7 working days (Mon-Fri). This slightly vary due to certain manufacturing conditions. Is a KBRS shower base one solid unit? It is a solid composite structure manufactured from varying components. Ie….EPS core, FRP Flange, composite fiber…epoxy resins…etc. Can you frame on top of the curb? Yes, as long as the wall is not a “load bearing” wall. Our curbs are tough enough to handle heavy glass shower enclosures, and glass block walls. We only build the best. Can the shower seats be cut-to-fit on site? Yes, the corner seat, ladies leg ledge and bench seats can be cut on site to any size using a common handsaw. Small adjustments can be made using a hand held orbital sander equipped with 80 grit sandpaper. The exposed area will need to be re-coated with ShowerSeal waterproofing. How can I ensure that the shower base is completely embedded in the thinset after I set it in place? Typically, professional installers use boxes of tile or buckets of water to supply a uniform weight to the shower base until the thin-set is cured. Following this procedure will result in a “rock-solid” installation. Also, be sure to securely tighten the shower drain’s “clamping ring” to the drain body in the sub-floor as recommended in the installation instructions. Is the drain kit included when I order a shower base? 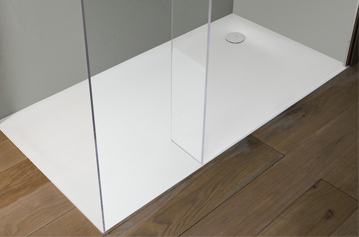 Only when you purchase a shower base with a Corian or Acrylic surface. The drain kit is not included with our ShowerBase or ShowerSlope. You can purchase a tile shower drain on our online store. I am installing my shower base on a wood sub-floor. Can I apply thin-set directly to the wood subfloor? If your sub-floor is structurally sound (no rotting…etc.) and level (very important), then applying thin-set directly to the sub-floor is okay. However, we do not recommend applying thin-set directly to particleboard. If your sub-floor is particleboard, then we recommend applying a few coats of an elastomeric waterproofing membrane to the particleboard sub-floor prior to applying thin-set.